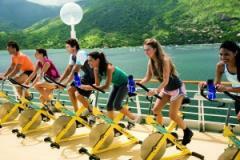 Royal Caribbean is offering a sports and fitness program on an upcoming Vision of the Seas cruise, February 5 to 12, 2011, dubbed Royal Life. The cruise features seven nights on board, with an intense schedule, for both adults and children, with activities such as spinning classes, rhythms, hydrobike, pilates, yoga (at sea and ashore), kids yoga and contest for the whole family, besides trekking Buzios accompanied by monitors. Best of all, the activities will take place overlooking the sea and the beautiful beaches of Brazil and the menus will always be a choice of dishes lighter and healthier. Participants will have the opportunity to attend lectures by experts as Szerman Ward, manager of the health and beauty and pioneer in the practice of aerobics in Brazil and in the implementation of PAS in the country. In Ilhabela, guests may participate in a volleyball clinic with Marcelo Negrao, Olympic champion and former national team player. There will also be lectures nutrition, with tips on how to build a healthy menu. In addition to Ilhabela, the scales of the ship include Rio de Janeiro, Buzios and Salvador. The loading can be done in Santos (February 2) or Rio de Janeiro (February 6). Guests will also enjoy moments of relaxation in leisure areas of Vision of the Seas , which has two pools, six whirlpools, spa, solarium, theater, shops and beauty salons, distributed in 11 decks. The ship has capacity for over 2,400 guests.